These soaring stocks still have plenty of growth potential. Selling a stock too early often turns out to be a huge mistake. It can be tempting to sell a stock after it doubles to lock in those gains, but the best stocks can double over and over again for decades. That's not to say you should never sell -- there are sometimes legitimate reasons to dump your shares. But a stock doubling isn't a good enough reason on its own. With the bull market still going strong, there's no shortage of stocks that have doubled recently. Three of our Motley Fool investors have singled out Shopify (NYSE:SHOP), Cisco Systems (NASDAQ:CSCO), and Chegg (NYSE:CHGG) as stocks that still have room to run after doubling in value. Here's what you need to know. Nicholas Rossolillo (Shopify): Shares of Shopify have been on a multiyear tear. As digital retail continues to expand, the e-commerce company's cloud-based store management solutions have reaped the benefits, with online and traditional retailers alike flocking to the service. The stock is up over 270% since the beginning of 2017. How did that happen? It's all about increasing the value of merchandise purchased (GMV) and value of payments processed (GPV) in the Shopify ecosystem right now. In 2017, GMV and GPV grew by 71% and 69%, respectively. That helped push total year-over-year revenue growth to 73% and led to the company's first full-year adjusted profit as a public company. 2018 got off to a good start, too, with revenues growing another 68%. All of that success has attracted attention, though. Short-seller analyst Citron Research has taken aim at Shopify multiple times over the last couple of years, calling into question the company's sustainability and business practices on social media; Adobe Systems (NASDAQ:ADBE) recently became a competitor when it purchased Shopify rival Magento; and Salesforce (NYSE:CRM) also has its own competing service with its growing commerce cloud. But Shopify has endured and continues to make advancements. A slew of new software and hardware upgrades were recently announced, including a new point-of-sale system, premium tap-and-chip readers for physical stores, and new apps for inventory management, marketing, and other back-office automation. Adoption of digital commerce is still early, and with only $8 billion in merchandise purchased on Shopify's global ecosystem in the first quarter, there is plenty of room for more growth. Tim Green (Cisco Systems): Shares of networking hardware giant Cisco briefly fell below $23 per share in early 2016. The stock has just about doubled since then, something you usually don't expect from a mature, slow-growing tech company. Cisco has been steadily shifting its business model toward recurring revenue over the past few years. Many of its growth businesses, most notably security, are heavily tilted toward subscription software. Even the core switching business is moving to subscriptions, with the latest Catalyst 9000 switching platform subscription based. Cisco's growing recurring revenue has acted as a headwind as revenue recognition got pushed into the future, but the company finally overcame this issue earlier this year. Cisco reported its first quarter of revenue growth in two years during its fiscal second quarter, and adjusted earnings grew at an even faster pace. Anticipation of this return to growth certainly played a role in the stock's stellar performance. While Cisco probably won't grow revenue all that quickly, a massive share buyback program fueled by the tax bill passed last year could help keep the stock moving higher. Cisco plans to spend $25 billion on its own shares over the next two years, enough to provide a meaningful boost to per-share earnings growth. Cisco stock probably won't double again anytime soon, but I think it's still a solid investment. Todd Campbell (Chegg): Chegg used to make its money buying, selling, and renting college textbooks, but in 2015, it began transitioning away from the print textbook business so it could focus on online learning. In the short term, shifting this business to Ingram in exchange for commissions dented Chegg's revenue, but now that more than one year has passed since the deal's been done, it's producing envy-inspiring margins and top-line growth. No longer having to maintain inventory, Chegg's gross margin should exceed 72% this year, up from less than 31% in 2014, and although profits are still elusive, demand for its online services, including study tools (Chegg Study) and tutoring (Chegg Tutors) is soaring. The company's total revenue grew 23% year over year in the first quarter of 2018 because digital services sales soared 37% to $56.3 million. 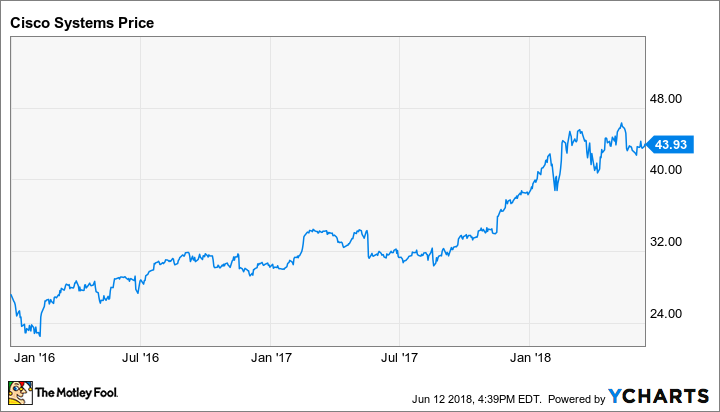 Chegg's digital services sales account for 73% of the company's revenue now, up from 66% one year ago, and there's no end to that trend in sight. Chegg's student subscribers increased 44% year over year to 1.6 million last quarter, and expanded offerings and better cross-selling of solutions, such as digital textbooks, online answers, online tutoring, and online test prep, offer plenty of levers to maintaining growth. Shares have already doubled, so this isn't a cheap stock, yet I can't help but think there's more room left to run. The post-secondary education market is massive, and interest in online education is ramping up, not slowing down. In 2018, Chegg's guiding for total revenue of between $300 million and $305 million, and industry watchers think the company's EPS will improve to $0.40 this year and to $0.54 next year. Given that Chegg has beaten analysts estimates in each of the past four quarters, those forecasts could even be too conservative.